DA GO135 D.A. 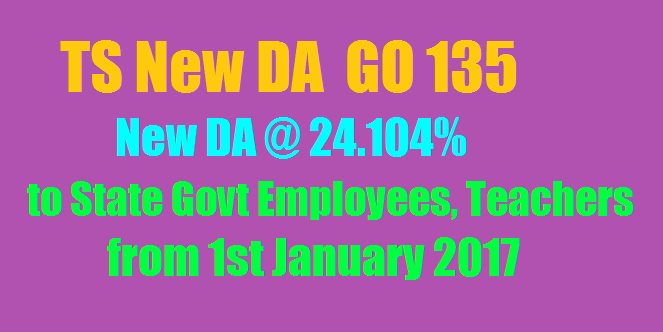 to the state government employees from 1st January 2017 Telangana DA/ Dearness Allowance Enhanced to TS Employees and Teachers in Telangana wide GO No 135 telangana ts go no 135 da 24.104% dearness allowance 2.096% enhanced to state government employees teachers . 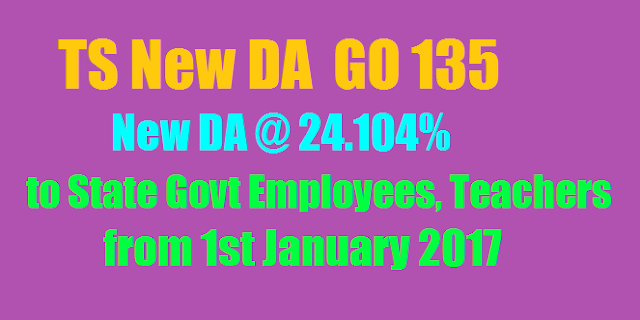 Telangana (TS) DA@24.104% From January 2017, DA GO.135 Dated:22-9-2017 for Employees,Teachers, D.A. to the state government employees from 1st January 2017, TS New DA @24.104% GO.135- Dearness Allowance 2.096% Sanctioned to Telanagana State Government Employees from 1st January 2017. TS GO.135 DA 2.096% Sanctioned to Telangana Employees, Teachers from 1st Jan 2017. D.A. G.O. No. 135, Date: 22/09/2017 DA Dearness Allowance Enhanced to Employees and Teachers in Telangana wide GO No 135 D.A. to the state government employees from 1st January 2017 D.A. G.O. No. 135, Date: 22/09/2017 TS New DA Jan 2017 DA 24.104% DA GO for Telangana (TS) Employees,TS New DA @24.104% GO.135- Dearness Allowance 2.096% Sanctioned to TS Employees from 1st January 2017,Teachers Latest DA GO 135 Dated:22-9-2017 Released as Dasara,Batukamma Festival Gift For all Employees In Telangana State. New DA Arrears : 01-01-2017 to 31-08-2017 to GPF and 90% CPS Adjustment.